• You can once again attack and fallback in the campaign. • Exception: You can not fall back after killing an SF unit. • Stability improvements with fallback action. • Some minor text updates in campaign. • Only new players can turn on training mode. • Training mode auto turns off when player is not a new player. • Campaign matches vs new players do not award the 1 ELO point bonus for winning a campaign battle objective. So if your opponent is a ‘Musketeer’, ‘Private’, or ‘Lance’ then you get no bonus point. • A training mode warning indicator, for both sides to see. • Bug Fix: Erratic units after fallback. • Bug Fix: Full replay removed from a completed solo match. • Bug Fix: AI in longer attacks itself after winning a battle. • Bug Fix: Pressing replay button twice in a row caused an issue. • New Leaderboard – just for Dukes. • Fixed iOS 8 issue for GeneralVimes. • Can now open matches that were passed. • Option to NOT give yourself ELO points for an expired match. • Minor adjustments and fixes. • ReplayKit: Newer devices can record in-game video. • Friendly Pass: Quit any match in the first 4 rounds. • Full point payouts for expired matches. • Full point payouts for quit matches. • Removed wind (updated manual). • Removed campaign single device lock. • Removed the invisible units in trees rule. • Dukes have one less musket & cavalry in Mini Match roster. • Reduced Mini Handicap to just 1 extra cavalry. • Quit matches (won/loss) can now be viewed. • Campaign units in trees are hidden until you move adjacent. • Added option switch for new player handicap. • Changed free mini matches from 3 to 5. • Campaign matches are now locked down. • Failed cavalry charge (dead) no longer scores when charging a base. • Fast machines can now read the battle report. • Final game list item now less obvious when you lose your commander. • Maps on iPhones can zoom fully. • Cavalry charges fixed + allowed vs obscured units. • Naarden city: +2 trees and can not fall back. • The Big Siege battle – has been completely replaced! • Less initial visibility in first battle of campaign. • Removed new player zone (the new handicap is better). • Fixed rare crash bugs reported through iOS by awesome players. • A FEW extra cavalry units for players with less than 30 pie pieces. • New Player’s can use expert-mode to turn-off the bonus cavalry ( handicap ). • Top Bar covers part of the map. Can scroll as expected now. • iPad Pro layout fixes – dialogs mostly. • Tutorial popups removed from normal battle. • Removed text shadows from main screen to improve performance. • Bug fixes based upon submitted crash reports. Thanks for reporting! • Support for larger iPhones and iPad Pro. • In-app purchases fixed (for iOS 9). • Usability improvements for first time players. • Balanced SF Artillery Reinforcements! • Naarden City Map – small buildings now treated as light trees. • Changed unit starting positions in the first battle. •Removed one important tree from the first winter map. • Changed Top Mini display from 7 to 20. • Heart button now goes ‘directly’ to the ‘write reviews’ page! • Let player decide if they want to connect to game center. • Analytics to find out if tutorial is losing users at any point. • Auto expert mode after view campaign ending. • Minor tutorial adjustments: Corrective suggestions and hints. • iPhone maps auto center when opened first time. • Toggle button to show top bar when hidden. • Fixed graphic glitch – box on game list item. • Removed Re-Match button (temporarily). Don’t forget that you can rate and review each separate update. Help grow the community of players and support MS with an app rating and/or by simply playing random matches. • Bug fixes. Extra Mini Match bases. • Updated last page of manual about upcoming WW2 game. • added iPhone support. MS is now universal. • added mortar to jazz up the second campaign battle. 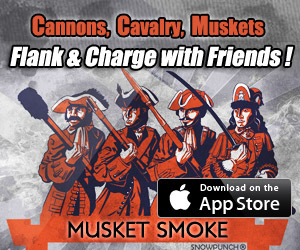 • added button with info about Musket Smoke II. • added online manual documentation for iPhones. • new players now default to normal online group. • now only support iOS 7 and above. MS 1.55 (includes an App Store Video Preview)• Added new ‘Light Mortar’ unit for Mini Matches. • Swapped campaign maps 1 and 5, we now start with Winter Keep. • Better water graphics on Big Ponds map. • Tested with iOS 8. • Added proper Mini Leader drop down unit info. • Added ‘New Player Safe Zone’ for online Mini Matches. • Added ‘Elite Zone’ for online Mini Matches. • Replaced Little Pond map. • Added a ‘no moves’ (detection) assistance popup. MS 1.52 We flanked and stomped more bugs! Blasted em good with grape shot and then trampled them into crispy little gore piles with our cavalry. • Roster now resets upon hit default. • Initial leaderboard scores are no longer zeros. • Nobody should be moving your units anymore! • Fixed missing trees on Artillery Delight. • Added issue detection code to help keep match integrity. • Rare match ACCEPT issues fixed. • Players and last move shown in floating notification. • Strengthened ‘The Breach’ wall in 4 popular points. • Fixed rare issue where you surrender and lose connection (freezes match). • Fixed rare issue ‘no moves sent’ and lost connection (freezes match). • Offline play with solo maps restored. • Invisible unit issue detection added. • Added some minor analytics to help with usability and improvements. • Buildings can no longer select adjacent melee targets and attack them! • All Time Top Commanders on front page increased to 10. • Waking the game no longer rarely disruptive to matches or match lists. • Match list loading improvements and fixes. • Now everyone can have a purple heart! • Fixed the rare ‘no moves sent’ bug. Added emergency fail-safe regardless. • Match state (‘play’, ‘wait’) is now checked on the fly when you open a match. • Fixed LOS issues with full replay. • LOS now hides stuff when a unit is killed in a replay. • Removed auto-run-match-from-lock-screen feature. It had issues. • Map names (when loading) now have a shadow to better contrast with backgrounds. • Instant preview damage (see how much damage you will cause before you attack). • Leaderboards for win counts and pie counts. • New pie ranking system that ties in with name rank achievement titles. • Top ELO like scoring leaderboards for competitive (random only) matches. • Info/top-bar extension (with live context info). • Double tap map to show/hide full screen mode. • Campaign SF Units now have visual distinction. • Rematch button (rematches friend or random ELO games). • Matches now start RANDOMLY on LEFT or RIGHT side (for Mini Matches only). • New “NEXT button”, goes directly to playable next battle – bypassing the games list. • 2 new maps (Mini Match/skirmish) for those who unlock ‘full multiplayer’. • Ability to add a leader unit to Mini Matches in full multiplayer. • Ability to see who can play Naarden Matches or start Leader Matches. • Reduced the number of free async mini matches from 5 to 3. • Cavalry can now damage buildings. • Morale hits no longer restricted by size (size 1 units are dangerous). • Taking a base ends attack and movement. • Can shoot wall with cannons at close range. • Siege Cannon can move and shoot (grape) even when enter ZOC. • Breakaways now only allow 1 movement action. • Musket Fire toned down (see manual). • Battle 1: Moved gate units back, added 1 cavalry. • Battle 3: Added 2 cavalry, removed 1 or 2 foot units. • Battle 4: Removed waypoints (cannon fight only). Added 2 Cavalry. • Battle 5: All middle trees are now light. • map (Open Field) added 1-3 random ‘light’ trees. • Campaign unit movement speed boost. Now similar to mini matches. • Better loading and list responsiveness. • New background graphics for Naarden and Mini Match game lists. • Size reduction (removed obsolete videos). • Many crash bugs fixed. • REMOVES LIMIT to active online matches. • 2 bonus Mini Match maps. • Ability to create a Leader unit within Mini Match maps (for both players). • Unlocks 9 Local player maps (solo training vs AI and pass n play). • Ability to create Naarden Matches (Online Multiplayer Campaign). • The green star acknowledgement. – a massive 97 textual corrections thanks to CarlRJ! – bug: unlimited movement. thanks to philo32b. – bug: 1 building in final campaign map doesn’t block movement. – bug: can no longer charge between rocks and trees. ie ‘Open Field’ thanks to philo32b. – main screen forum button now points to blog (with pass through) to forum. – some changes within the heart button on main screen. MS 1.20 Stability fixes: Thank the patrons of Pocket Tactics for this update. – proper spelling of ‘siege’ (thanks to Bullwinkle). – fixed tapping on game that was quit caused black screen. – campaign now correctly reports Army sizes. – Profile pies now accumulate across multiple games. – changed unit colours for non-campaign games. – auto display Game Center login when needed. – added twitter and and heart button to the start page. – bug and typo fixes. – new Tutorial and info video.